Ever since his highly-publicized retirement in 2013, which lasted just two months, Steven Soderbergh has been directing projects, both films and series, with renewed energy. Of course, he's long been pleasantly unpredictable about the projects that catch his eye, and so the idea of him making a "sports movie" for Netflix sounds curious, yet delightfully illogical. 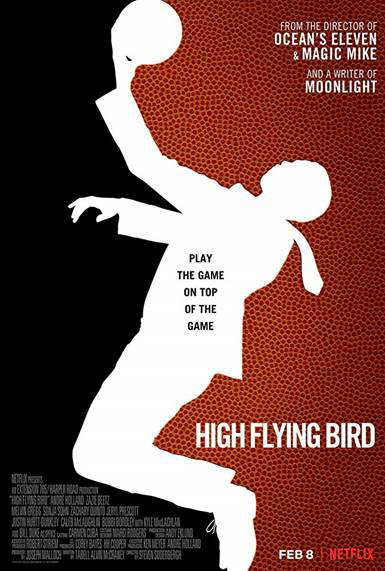 In its very first sequence, however, it becomes apparent that High Flying Bird is not a sports movie in the traditional sense. It takes place while the professional basketball season has been shut down due to an impasse in contract negotiations between the team owners and the players. This exerts greater pressure upon #1 draft pick Erick (Melvin Gregg), who is still waiting for the first check from his new contract. 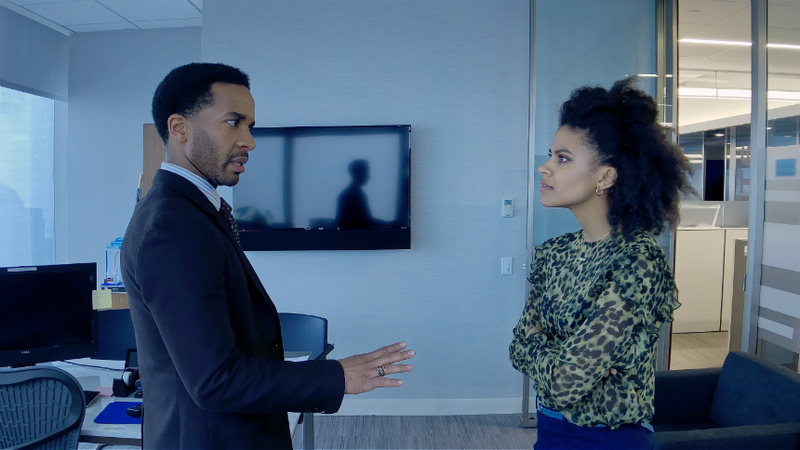 His agent, Ray Burke (André Holland) is facing, theoretically, even greater pressure, because he doesn't earn any money while the players are locked out. That first sequence is a deep plunge into the characters, written in whiz-bang style by Tarell Alvin McCraney and directed by Soderbergh with his usual aplomb. (As usual, Soderbergh also serves with flair as his own director of photography and editor.) The language is rich and attuned to the distinctions between Ray and Erick: they are both educated and intelligent men, but their approach to life and their experience varies quite a bit, and that's reflected in their conversation. Academy Award winner McCraney, a playwright who wrote the material that served as a source for Barry Jenkins' Moonlight, fashions a compelling narrative that steers around any expected notions, instead drawing distinct parallels to the sport and slavery. It's not the same thing when we're talking about a limited number of players making (potentially) millions of dollars, but the players do not profit as much as the owners and enjoy far less freedom in their choice of employment. And the wealthy owners are predominantly white, while the players are predominantly black. What's also quite clever is that we're never quite sure where anyone's allegiances and loyalties will end up. It's not a caper flick, like Soderbergh's Ocean's trilogy, but High Flying Bird moves in similar swift fashion, challenging the viewer to keep up with Ray Burke. Holland previously worked with Soderbergh on period medical series The Knick and also played a key role in Moonlight (as well as an important role recently in Castle Rock). In his performance, Ray Burke is a thoroughly professional agent/manager, highly proficient at what he does, and very very driven to succeed against all odds. He's also gracious, thoughtful and respectful of others, but he will not allow anyone to stand in his way. The film is also benefited by the presence of Zazie Beetz as a rising assistant who is on the verge of advancement, along with Bill Duke as a wise veteran coach who knows a thing or three about life, sports, and slavery, as well as Kyle MacLachlan, a white lawyer for the white owners. Sonja Sohn, who made a vivid and lasting impression on The Wire, portrays the firm leader of the players' union, while Zachary Quinto contributes a brief, dark turn as Burke's boss. Mostly, High Flying Bird is driven by André Holland, the script by Tarell Alvin McCraney, and Steven Soderbergh's filmmaking, which makes it all soar. The film will be available to stream on Netflix as of Friday, February 8, 2019.